MotoGP Japan: Pole man Rossi seeking race pace boost. Valentino Rossi feels fierce rivals Marc Marquez and Jorge Lorenzo currently have an edge on race pace as the Movistar Yamaha rider prepares for his 64th Grand Prix pole start in the Japanese MotoGP. Rossi set the fastest time in Q2 on his final lap to head up the front row from Repsol Honda rider Marquez by 0.180 seconds, with Lorenzo completing the front row. However, the nine-time world champion says he needs to improve his overall pace slightly to be in with a chance of taking victory at Motegi. “To make the pole position is always a special feeling. This time also more because we struggle all the time during the practice. Yesterday we were a bit in trouble but especially this morning we expected to improve, but it was not enough and I was quite far,” Rossi said. “But we worked well with the team and we improved a lot the balance of the bike for FP4. In fact in the last practice I was already faster and competitive, so I was more positive for the qualifying and I think that I can fight for the front row – also because in the last year always in Motegi I have a good qualifying. “In FP4 I improved the pace a lot and this is important for tomorrow. Looking at it on paper, also [Andrea] Dovizioso and [Cal] Crutchlow are very strong but I think that me, Marquez and Lorenzo are the strongest,” added the Italian. Rossi, meanwhile, is concerned over his fitness. The 37-year-old is feeling under the weather with a cold in Japan, which he feels could prove problematic in the closing stages of the race. Rossi, who is 52 points behind Marquez with four races including the Japanese round remaining, expects a close battle on the opening laps involving a number of riders, with Ducati's Andrea Dovizioso, Cal Crutchlow (LCR Honda) and Suzuki duo Aleix Espargaro and Maverick Vinales also displaying strong pace at the Twin Ring circuit. “As always the first three or four laps of the MotoGP race are always crucial so you have to try and stay in front from the beginning and try and push at the maximum from the first corner. After the first part, the race will be very long – 24 laps – but it looks like with the tyre you can keep a good rhythm. 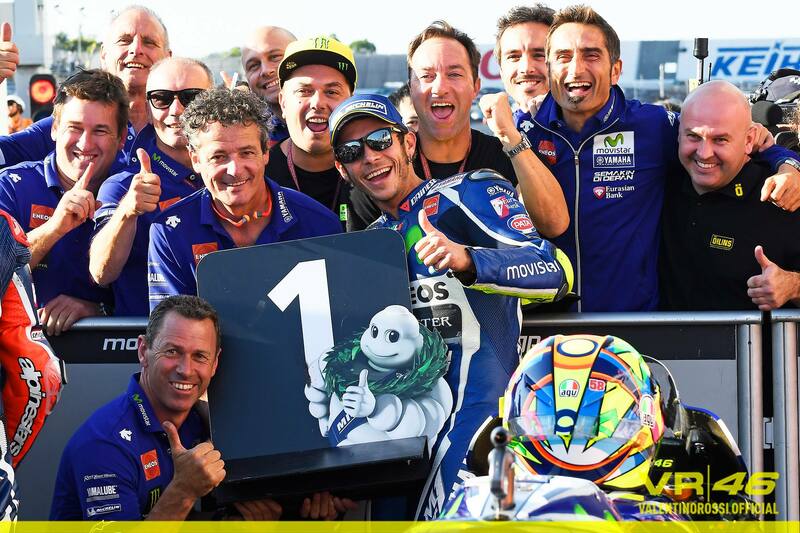 Lap by lap it becomes always a bit more difficult and it depends on which rider can keep the pace to the end,” Rossi said. Championship leader Marquez lost the chance to stake his final claim for pole when he slackened his pace after encountering yellow flags following Crutchlow's spill at the end of Q2. Rossi posted his pole time on the same lap and said he continued to push once he realised Crutchlow's bike 'was not on the line'. The Doctor also explained his strategy when he followed Suzuki rider Vinales after the pair exited pit lane together on fresh rubber. “We exited more or less at the same time on the second tyre because I think that there were not a lot of riders making three laps with the first tyre. I was in front but after, Marquez arrived and was pushing and he arrived a little bit wide. He slowed down, so I slowed down because I don't want to push and Maverick passed,” Rossi said. Motegi places huge demands on braking and Rossi admits it is a key area of focus, with overheating discs resulting in a loss of performance that can prove costly. “In this track for the brakes, it is one of the worst and we have always to fight with the temperature. Everybody uses big discs and big pads - the maximum to keep the temperature down. If you lose a little bit of performance it becomes very difficult but we are at the limit. In the race when you follow another rider at a short distance for sure the temperature increases a lot and this can be an issue for the race,” he said.